RAK New Year’s Eve party will host rocking music with different DJ’s playing under the stars in the great atmosphere at Al Marjan Island. RAK NYE plans record-breaking spectacular Fireworks to light up Ras Al Khaimah skies for this New Year’s Eve. This new year event also offers the Ultimate Camping Experience for the festival goers who wish to stay in Tents and kick off the New Year. Over 12 Food Trucks will serve tasty delicacies. 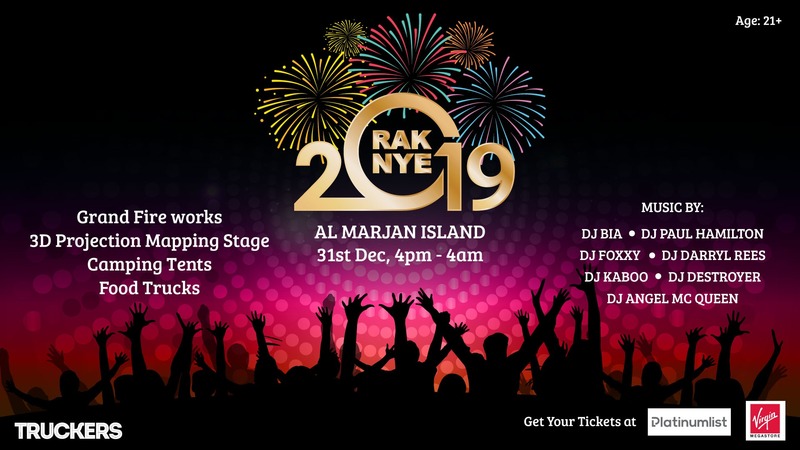 RAK NYE 2019 artist lineup features an eclectic mix of talents: DJ Bia, DJ Paul Hamilton, DJ Foxxy, DJ Darryl Rees, DJ Kaboo-One, DJ Destroyer, DJ Angel MC Queen.